In the early sixties, Calvin Trillin got his start as a journalist covering the Civil Rights Movement in the South. Over the next five decades of reporting, he often returned to scenes of racial tension. Now, for the first time, the best of Trillin’s pieces on race in America have been collected in one volume. In the years that follow, Trillin rides along with the National Guard units assigned to patrol black neighborhoods in Wilmington, Delaware; reports on the case of a black homeowner accused of manslaughter in the death of a white teenager in an overwhelmingly white Long Island suburb; and chronicles the remarkable fortunes of the Zulu Social Aid & Pleasure Club, a black carnival krewe in New Orleans whose members parade on Mardi Gras in blackface. He takes on issues that are as relevant today as they were when he wrote about them. Excessive sentencing is examined in a 1970 piece about a black militant in Houston serving thirty years in prison for giving away one marijuana cigarette. The role of race in the use of deadly force by police is highlighted in a 1975 article about an African American shot by a white policeman in Seattle. Uniting all these pieces are Trillin’s unflinching eye and graceful prose. 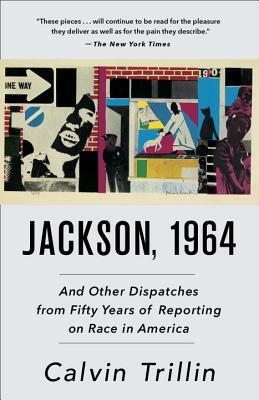 Jackson, 1964 is an indispensable account of a half-century of race and racism in America, through the lens of a master journalist and writer who was there to bear witness. Calvin Trillin has been a staff writer at The New Yorker since 1963, when the magazine published “An Education in Georgia,” his account of the desegregation of the University of Georgia. He is the author of thirty books. His nonfiction includes About Alice, Remembering Denny, and Killings. His humor writing includes books of political verse, comic novels, books on eating, and the collection Quite Enough of Calvin Trillin.